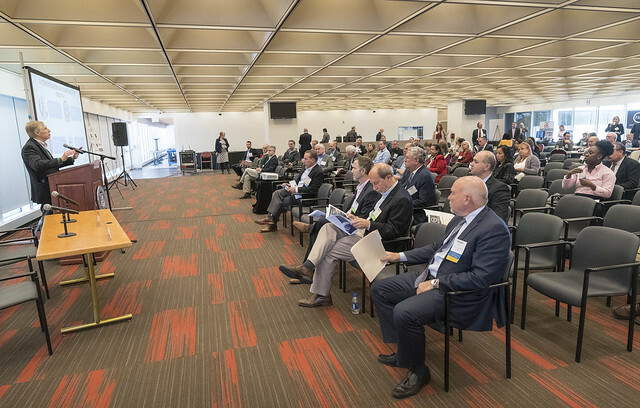 Sixty-eight businesses sent representatives to Sacred Heart University recently for the second annual ScaleUp CT Conference at West Campus. The Connecticut Technology Council, a nonprofit organization that serves the needs of enterprises working in technology and innovation, conducted the event for students majoring in business, computer science and computer engineering. The conference comprised CEO workshops and a series of discussion panels, and it concluded with a networking event. The workshops enabled participants to have peer-to-peer sessions with CEOs, CFOs and marketing professionals who elaborated on how their roles directly assist their companies’ growth. The panel discussions covered traditional and non-traditional ways to finance a company’s growth, techniques for finding talent to assist in growth and the process of scaling a company domestically and internationally. Speakers included representatives from UPS, Carter Morse & Goodrich, the U.S. Department of Commerce and the University of Connecticut. A resource connection area was available for those who wanted to meet with the sponsors of ScaleUp CT. When the conference concluded Tolga Kaya, director of the computer engineering program said employers reached out to him asking how to get in touch with the talented students as they wanted to hire many as interns and full-time employees. The vision for West Campus is to have it become an innovation hub with the goal of bringing students and businesses together to foster creativity and generate ideas.